I see Lion have released a new add campaign to coincide with 110 years since the “Originals” tour of Great Britain. Those rugby nuts amongst you may know that there was in fact a New Zealand Native tour of Great Britain before the Originals” – almost 17 years before! One of John James Stanaway’s grand children TIKA MINARAPA (RICHARD MAYNARD) 1867 -1897, was a member of this Native team. (Check out the link). The New Zealand Native Football Representatives’ tour of Britain is relatively unknown. 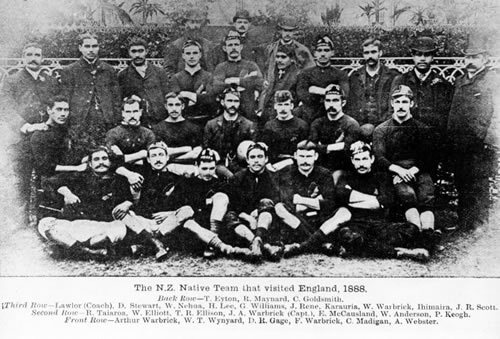 The first New Zealand representative rugby team to tour beyond Australia, they played their first game in Britain on 3 October 1888. The title of ‘The Originals’ was bestowed on the next New Zealand rugby team to tour Britain, that of 1905/6, which arrived home to an official welcome befitting conquering heroes. But even though it was soon forgotten, the Natives′ tour was to have enduring significance for New Zealand rugby and society. This team photo is thought to have been taken before the Middlesex match in October 1888. Back row: Thomas Eyton (co-promotor), R. Maynard, C. Goldsmith. Third row: J. Lawlor (coach), D. Stewart, W. Nehua, H.H. Lee, G.A. Williams, T. Rene, Wi Karauria, William Warbrick, E. Ihimaira, J.R. Scott (manager). Second row: R.G. Taiaroa, W. Elliott, T.R. Ellison, J.A. Warbrick (captain), E. McCausland, W. Anderson, P. Keogh. Front row: Arthur Warbrick, H.J. Wynard, D.R. Gage, F. Warbrick, C. Madigan, A. Webster. The Natives had originally been called New Zealand Māori. 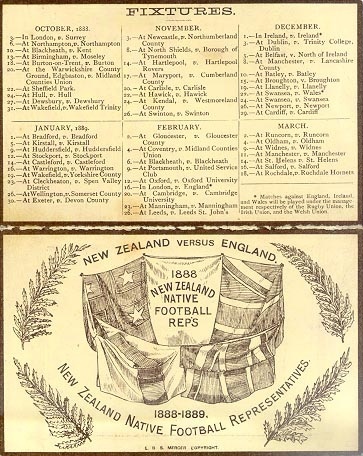 After five Pākehā (non-Māori) were selected to strengthen the touring party it was renamed by its promoter on the basis that all 26 team members were New Zealand-born. This was untrue: two of the ring-ins had been born overseas. Most of the team assembled at a training camp near Napier in May 1888, and they played their first match against Hawke’s Bay on 23 June. Before they left New Zealand they were condemned as a ‘poor team’ who wouldn’t beat the top local club sides. But after they slipped quietly back into the country a year later, their play was praised as a ‘fine exhibition of what several months of combination and practice will do’. By the time the Natives dispersed at Auckland in August 1889, they had played a staggering 107 rugby matches in New Zealand, Australia and Great Britain, winning 78 of them – plus nine Australian Rules and two association football fixtures! For much of that time no more than 20 of the touring party were fit, forcing those who were into a playing schedule that no modern team would contemplate. ‘Their War Cry before starting play’. 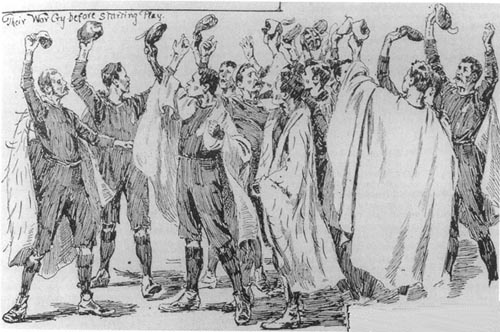 This cartoon of a pre-match haka by the New Zealand Natives’ rugby team was published in England during their tour of 1888/89. A major book on the Natives’ tour by historian Greg Ryan, Forerunners of the All Blacks (Canterbury University Press, 1993), provides a detailed study of the tour, and anyone interested in further information on the topic should consult this book. This excert draws extensively on Dr Ryan’s research and insights. Material from Forerunners of the All Blacks. The average age of the tourists was about 22. Nearly all were single and had poor job prospects. An expenses-paid trip to Britain must have appealed to them. The team cap for the New Zealand Natives’ rugby tour of 1888/89 was notable for the first use of the silver fern in New Zealand rugby. This symbol would come to be used on most New Zealand sporting uniforms. This entire team are now members of the World Rugby Hall of Fame. This entry was posted in Uncategorized on July 31, 2015 by gregorypaulskinner. Laura Stanaway 1869 – 1951 – She was the third daughter from JJ and Sarah’s marriage. We have added further pictures to a number of the pages. 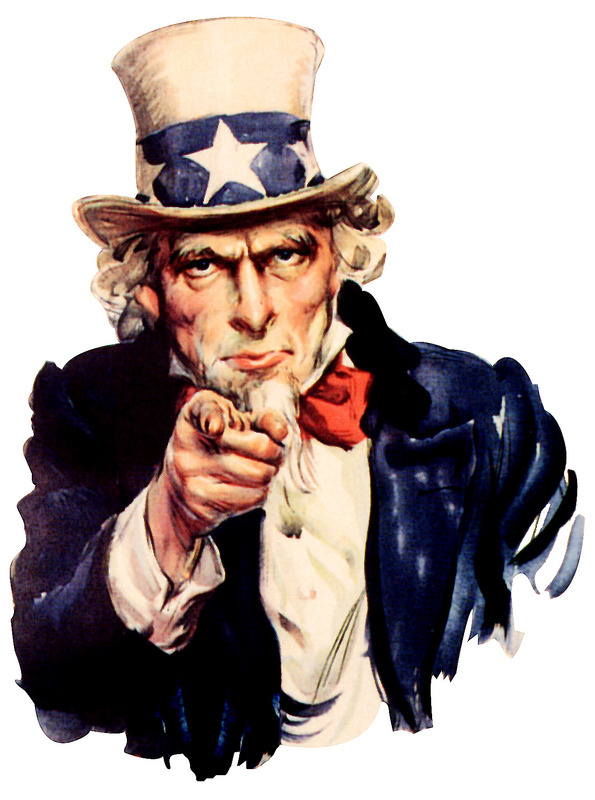 Dont forget to “Leave repy’s” if you have any comments, corrections or additional information on any of these pages. This entry was posted in Uncategorized on July 30, 2015 by gregorypaulskinner. Why dont you follow us on this web site – it is simple – you will be kept upto date with the latest updates and additions. As we add (I will not say complete) the page for each child or grandchild you can recieve notification via email. 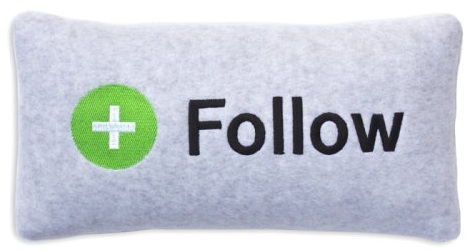 You may have noticed on your screen in the bottom right corner a blue circle with a cross in the middle (similar to this one) and the word “follow” – click on this and follow the instructions. This entry was posted in Uncategorized on July 29, 2015 by gregorypaulskinner. For those of you who want some reading check out your ansestors last Will and Testament. It is 2.18MB so may take 40-50 seconds to down load. The Last Will and Testament of John James Stanaway Esq. June 1872. There is also a link to this on the Kaipara and Tokatoka page. This entry was posted in Uncategorized on July 28, 2015 by gregorypaulskinner. As the heading suggests, you help is required. To be able to collect, compile and insert information of the Stanaway family and get this record somewhere near complete, we need your help. Some of the listed family members we have a lot of information on, and other ‘s very little to none. We are therefore asking descendants of the Stanaway’s to help us fill in the blanks. We have already made contact with some of you but we are in search of more as gems of information and records we know are scattered amongst you, in a box under the bed or in the attic. So have a dig around and send any information you may have – no matter how small you may think it is it may unlock a lot more, or provide the clue we need to unlock more family history. This entry was posted in Uncategorized on July 17, 2015 by gregorypaulskinner. 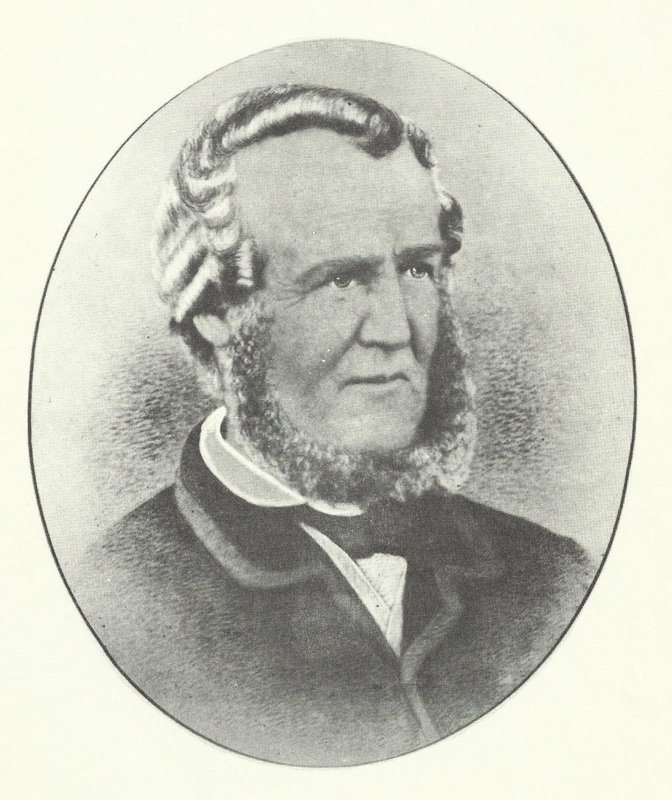 Finally – I have started to publish online the results of a number of years research into my 3rd x great grandfather, who settled in New Zealand in about 1839. Initially I was wanting just to know when he arrived and how he came to settle in NZ, but this seemed to grow into what was he doing then into what were his movements, time lines, photographs, stories etc. In researching my family tree, I have uncovered a multitude of information on Captain John James Stanaway and his descendants. With the advent of the internet and Google searches, information has been easier to obtain than when the Mariners first started the “Tides and Time” family tree book. Alas, the internet was not around back then it may have made shorter work of the task that faced them. The recent 2013 updated version of the same book is inspiring as well and thanks to Wendy Clarricoats for her time and effort to get as many of these printed as possible. Details of John Stanaway’s colourful life are recorded in a number of places some of which is conflicting. What is recorded here is a small extract from the records of his descendants, my own research including that published by Mervyn and Alexandria Marriner in 1985 following 30 years of research. I have tried to piece together his movements around the world, and uncover how he came to settle in New Zealand. I have spent many hours, searching the local museums around Hokianga, and Kaipara, I have visited Probus in Cornwall, trolled through web sites, births marriages and deaths, newspapers, electoral rolls, Government and Council archives. What I have uncovered is a not definitive but more of the likely story of one man’s life. I have also included where possible details and stories of his children and great grand-children, again these are in no way complete, I know other family members have the missing pieces to this tail and maybe over time it will be completed. One thing I do want to encourage was for different family members to post any or as many family photographs, stories or documents as they have on this site, to share memories of our family and whakapapa, as it is of no use to anyone remaining in a box to be forgotten. I have tried to present as much information I have found as possible, photographs, newspaper cuttings, births deaths and marriages, exerts from books and where possible family members memoirs in this web page, and will update as information comes to light. To those who have contributed I thank you and hope you enjoy. This entry was posted in Uncategorized on July 15, 2015 by gregorypaulskinner.